NetWellness receives many questions about bumps and lumps in the oral cavity. There are many normal structures that can be “bumps” in the mouth, but there are other “bumps” that can be a sign of disease. The only way to be sure what these bumps and lumps are is to have an evaluation by a dentist or oral specialist such as an oral pathologist. 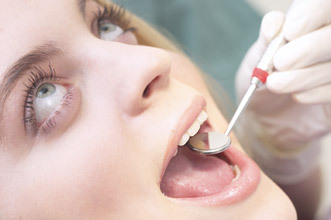 These dental professionals can provide you with a definitive diagnosis. Bumps on the back of the tongue: Bumps that are lined up across the very back part of your tongue and are about the same size probably represent what are known as circumvalate papillae. Most people have about 6 to 8 of these normal structures that form a V that points to the back of the throat, but often they are not noticed because they are so far back. Usually these structures can’t be seen unless a person sticks their tongue out really far, and they may not be noticed until later in life when a person might have a sore throat, stick their tongue out, and look at it in a mirror with good lighting. “Lie bumps” on tongue: Transient lingual papillitis (TLP) is a harmless, but annoying, problem. This condition is limited to the upper (dorsal) surface of the tongue, affecting some of the tiny bumps on the tongue known as the fungiform papillae. Fungiform papillae are the normal little bumps on the top of the tongue that people call “taste buds.” These bumps can become notably red or white and are quite tender for one to several days. While the cause of TLP is not known with certainty, most experts feel that local accidental trauma (rubbing, scraping or biting) is a major factor, however, contact reactions to things like certain foods have also been suggested. Most people, when their tongue is irritated, can’t seem to keep from rubbing it against the teeth to make it feel better (sort of like scratching an itch); however, this usually makes things worse. Over-the-counter medications such as OraBase or Zilactin can be applied. These materials act like a bandage and help to protect the ulcerated surface of the fungiform papilla. Tiny bump on tip of tongue: The most likely possibility is a benign growth called a fibroma (irritation fibroma). Most fibromas in the mouth are thought to arise following local injury or trauma, like biting your tongue. Some can grow to substantial size; no treatment is necessary unless it gets bigger or is in the way of speaking or eating. Black bumps on tongue: There are several conditions that this could represent, most of which would be benign (not cancer). An evaluation by an oral pathologist would probably be appropriate. Bump under the tongue: This may be a common process known as an Exostosis or mandibular torus. In essence, these represent extra bone that most often occurs on the tongue-side of the lower jaw or on the roof of the mouth. Since these bumps protrude from the rest of the jaw, they are often injured by sharp or hard foods. Such injury may lead to a painful ulcer or sore that is slow to heal since the area gets bumped and bruised a lot when you eat. Lingual tonsils, located on the under-side of tongue, may become temporarily swollen and red due to a cold or viral infection. They should resolve after your cold goes away. Gumboil: Also known as a parulis, these bumps usually occur around the teeth toward the lips or cheeks. They can arise on the roof of the mouth as well. They are typically caused by a non-vital tooth (tooth with a nerve that has died due to decay and infection) and may cause a salty or bitter taste when they pop or release their contents (mostly pus). Bumps on the back of the throat: We call these bumps “subepithelial lymphoid tissue”. These collections of immune cells (lymphocytes) are there to protect us from infections and represent a normal finding for this area of the mouth and throat. They normally enlarge when we have a viral or bacterial infection in this area, and generally they become less noticeable when the infection is over. A bump behind the front teeth is likely what is known as the incisive papilla. Everyone has one of these bumps, and you would need to see someone who is familiar with the mouth in order to find out if your incisive papilla is enlarged or just temporarily irritated. Your dentist might be a good place to start, but you may need to be evaluated by an oral pathologist as well. If you smoke, and especially if you smoke a cigar or pipe, whitish bumps on the palate (roof of the mouth) could represent a benign condition known as smoker’s palate (nicotine stomatitis). These bumps will often have a small reddish depression in the center that could look like a little hole in the mirror. An Exostosis or mandibular torus may also be found on the roof of the mouth, in addition to the tongue-side of the lower jaw. This common process represents extra bone that protrudes and is often injured by sharp or hard foods. Such injury may lead to a painful ulcer or sore that is slow to heal since the area gets bumped and bruised a lot when you eat. Mucoceles can form on the roof of the mouth. This happens when one of the small salivary glands either is blocked or is cut. Mucus builds up under the lining of the mouth until it reaches a breaking point, then the bump disappears, only to re-form again. An oral surgeon usually has to remove the little gland in order to completely stop the process, but this is a rather minor procedure. The tissue should then be examined by an oral pathologist in order to make sure that the bump doesn’t represent a rare salivary gland tumor of this area. These could be normal structures in this area, such as minor salivary gland openings or little yellowish-white oil glands called Fordyce granules, which are tiny sebaceous (oil) glands that are found to one degree or another on the upper lip and inner cheeks of 9 out of 10 adults. They are harmless. Mucoceles or mucus duct cysts are usually found on the inner lower lip. They are caused by the disruption of the tiny ducts (tubes) that carry the mucus from the minor salivary glands in the lips to the surface of the mouth. Trauma can cut these ducts, resulting in the mucus spilling into the tissues under the lining of the mouth, producing a soft painless bump. These usually will not heal on their own; however, excision can lead to the appearance of more mucoceles. When should you be concerned about lumps or bumps in your mouth?